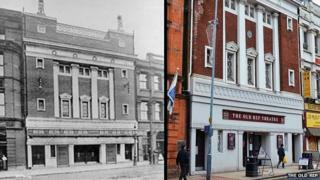 An arts school has taken over management of the 101-year-old Old Rep Theatre in Birmingham. The Station Street theatre was facing an uncertain future as Birmingham City Council wanted to cut its £20,000 a year running costs. The Birmingham Ormiston Academy, which teaches the arts to 14 to 19-year-olds, has signed a five-year lease, with the option to extend to 2024. The Millennium Point-based academy will use the Old Rep for teaching and shows. Laura Rogers, from the academy, said the college has already invested in improving the backstage areas. She said: "Professionals and amateurs will still perform there but central to our bid was that it will be a theatre for young people, run by young people. "They will get the chance to use it as a performance, rehearsal and classroom space as well as learning the technical side and theatre management there." She said the academy had quickly outgrown its Millennium Point performance facilities so the old theatre would be a "kind of extension of the school". The theatre was built in 1913 and became known as The Old Rep when the Birmingham Repertory Theatre, in Centenary Square, was built in 1971. Council deputy leader Ian Ward said: "We don't have the funding for proactive programming or marketing so the theatre has not been used to its potential. "I believe that Birmingham Ormiston Academy will breathe new life into this wonderful space." He said the theatre was previously only used for 20 weeks a year but would in future be used for teaching performance and 'behind the scenes' skills. Students will follow in the footsteps of actors Laurence Olivier, Peggy Ashcroft, Michael Gambon and Derek Jacobi, who launched their careers on its stage.